One of the things that I used to read regularly was the Daily Text. That’s what most Witnesses call it in everyday speech, but it’s formally titled, “Examining the Scriptures Daily”. It used to be read before field service meetings, however that is no longer done. When I was little I remember it used to be bound into the back of the Yearbook. At any rate, I read “The Text” nearly every day, and often looked up the Watchtower article the theme scripture was taken from, and researched the verse in other translations and read the context also. This was something my mother inculcated into me at an early age and it seemed like a good thing when I was an active adult member to do. It was a way to daily feed on the Word of God and I used it for that purpose. When I was a Bethelite the family even received it in a “tear-off block”, sort of like a daily calendar that’s gummed on the back, so they could grab the individual sheet without having to tear it out of a booklet and ruin it. Now as a Witness I had always thought that we basically invented everything that was good about serving Jehovah. I really did, and of course the Daily Text is such a valuable commodity among Jehovah’s Witnesses I always took it for granted that there was no other thing like it anywhere outside of the organization . Having only been raised with the religious background of being a JW, (my father was spiritual but not a church-goer) and never ever going to another church, never hearing a sermon from another Christian minister, how else could I or would I know any different? When a person is immersed in the JW culture and experience it from their infancy on, we have no other frame of reference. It wasn’t until the last few years that I started using the excellent Bible study program E-Sword that I saw they had a category for downloading and then viewing, “daily devotionals”. What‘s that? I wondered when I first saw it. I had heard the word “devotional” and knew it to be some kind of term Christendom used, but up until that time that was all I knew. Well lo and behold it turns out that I had been taught to use a “daily devotional” my whole life, and that myself and all the other Witnesses have used one every day called “Examining the Scriptures Daily” for their entire lives! In fact, the early Bible Students used a book called Daily Heavenly Manna for the Household of Faith in a similar way. So the custom of Christians reading a daily devotional has been around for hundreds of years apparently. Charles Spurgeon wrote a daily devotional more than 100 years ago and preached to over 10,000,000 people in his ministry and authored dozens of Christian publications that witness about God and Christ, so this is more evidence that it is not a Watchtower invention. So to change the subject just a little, I have been following (as many of us Strugglers have) the so-called “new light” given at the Annual Meeting of Jehovah’s Witnesses just this last month of October, 2012. Briefly put, the Governing Body now declare that they alone are the “faithful slave” of Matthew 24:45-47. They further postulate that this group of which they are the exclusive members of has only existed since 1919 and not since the first century as had been taught for the past 100+ years by the Watchtower Magazine and its leadership. They recently announced it online at JW.org so it is now official WT teaching and must be followed and believed by all Jehovah’s Witnesses. It turns out Watchtower’s Governing Body was wrong about who it was the spokesman for! That’s right. Though one would think it impossible not to know who you’re a spokesman for, it turned out not to be so impossible for the Watchtower organization to get this fundamental matter of fact just plain-old dead-flat wrong. As of now, Watchtower’s Governing Body realizes the whole time it has been no more than a spokesman for itself. Yet, until now this leadership was apparently confused about who it was listening to and speaking for. The whole time Watchtower’s top leadership has only been listening to and speaking for itself! And, we have this confession right from the source itself. Help spread the word by sharing Our Daily Bread with your friends on Facebook, Twitter, or by email. Since it was first published in 1956, Our Daily Bread has become the resource for which RBC Ministries is best known. The daily devotional thoughts published in Our Daily Bread help readers spend time each day in God’s Word. Our Daily Bread is published and distributed worldwide in more than 40 languages by RBC Ministries offices around the globe. RBC Ministries also produces a variety of other Bible resources, which are available for the asking. RBC Ministries is not funded or endowed by any group or denomination, many people, making even the smallest of donations, enable RBC Ministries to reach others with the life-changing wisdom of the Bible. Our Daily Bread radio is a daily audio program that features insights from the pages of Our Daily Bread. Each daily thought is designed to draw the listener into a closer relationship with Jesus Christ and to evoke responses of worship, love, trust and obedience. 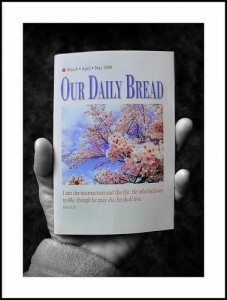 Today, Our Daily Bread is distributed via print, large-print, radio,podcast, email, rss and mobile. For social networking users, find Our Daily Bread on Twitter and Facebook. are the same ones that nearly all of the Christian denominations use as well. Ones like Hebrews 10:24-25, John 4:24, 1 Peter 5:9, Philippians 2:5-9, Matthew 24:3, 2 Timothy 3:1-5, Luke 22:19, 2 Timothy 3:16- 17, Galatians 5:19-22, Psalms 55:22, etc., etc., etc. The Daily Text always left me feeling empty and wondering who on earth chooses such inappropriate subjects for the start of the day. Now I read a daily devotional by Selwyn Hughes at CWR. It’s encouraging, deep but not too deep, continues on the same theme for a few days and is uplifting. A refreshing change! Our Daily Bread has been a source of encouraging thoughts for the day , for a few years for me . My “X”-fiance and I would always have it at hand . It is true that there will be found some flaws in it , but they seem seldom , and definitely a better source that clings to the essence of Scripture than the aforementioned cult publication from the WTO . It’s a “free” publication that is found at many churches , though RBC asks for some support if subscribed to in paperback form . I’ll give it 1 1/2 thumbs up ! There are also other tools like the Revised Common Lectionary. I remember going to a Saturday service at a Disciples of Christ church, then the next day, going to a Methodist church and hearing the same Bible readings considered. When I inquired about that, I learned that many denominations get the readings from the Lectionary. Therefore tens of millions of Christians consider the same Bible passages every week—more than the seven million JWs during the theocratic ministry school. The Governing Body would be content for us to believe they were the Source for these practices…not so. It is apparent that the Writing Department has relied heavily through the years of external Commentaries, especially for tools like the Aid or Insight books, or the All Scripture Inspired books. Without Commentaries, none of these publications would be possible. Brother Ray Franz was deeply impressed when he was in the Writing Department: some Christian Commentaries were over a hundred years old and still just as relevant as the day they were written because they were truly based on God’s timeless Word, whereas—who considers what the Society wrote a hundred years ago? What publication is still in use? And if so, would anyone consider it just as relevant? Absolutely not. Is is the daily text or is it our daily dose of mind control? Oh how sad that we don’t appreciate the great wisdom and understanding of the only channel of God! Shame on you watchtower! Another good option is to just open up the Bible on a daily basis and read some verses and reflect on them ; maybe discuss them with a friend . That works well , and it’s already available . This gives us a good glimpse of the mind of God . And to what end shall we read the Bible daily ? (Pro 1:20-23 , ISV) : “Wisdom cries out in the street; she raises her voice in the public squares. This is what we all need . A daily text or two is good for us . i have been raised as jw, 3rd gen…i can say i am aware that other denominations also have their own ”Daily Bread”, songs of praises etc etc…in fact when i was already past my teen-age years, there are christian books that i have read that i chose because they dont seem to favor a certain religion (in short the books are bible based and that any christian person can relate to the topics discussed)…so even before i had this slight idea that the jw religion is just like any other religion. and we do have our own publications, lesson books and reading materials. so it is not a unique characteristic. i have also relatives who are not jws but are active in their religion (some catholics) they also have daily,nightly routine set aside for spiritual upbuilding in the family….so basically, the only thing that i guess really convinced me was the inculcation that our teachings were the truth compared to others. another difference also is that, we always tell others that ours is the only truth and that we cannot read other publications from other churches. unlike other christians who are free to read anything and just pick and choose which ones they find believable or not.for example, the NWT bible translation. we tell people that it is the most accurate translation, without any disclaimer whatsoever. but the catholic priests,to their own catholic bible, don’t make such claims. they just say that their version of bible is designed for those who are already fully decided and fully convinced to be roman catholics, but for those who are still searching and would like to dig more about the bible, it is more beneficial for them to look through other standard bible translations. that is why when faced with debates, the catholics can easily say they never make such absolute claims of being the only true religion anyway. so i guess that is one of the reasons, why most jws really get upset and frustrated when they discovered stuffs outside the org. it is mainly because of the org’s dogmatic way of teaching. I have been reading the booklet, our daily bread, and I find it very positive, without the judging and finger pointing that goes on in a lot of the GB writings, and the focus seems to be more on ones personal inventory and how to be encouraged by the bible. I also attend a small bible study group that goes throught the bible by a few chapters a week, and rarly is any doctrinal issues ever bought up, and only in passing. I was floored, when I noticed that quite a few individual voiced their own thoughts that differed from the one conducted the study, and it was totally ok to disagree on some points, and encouraged because it added to the study. Since I left the GB mind-bender control machine, my spritiual life has really taken off, and there is life beyond the GB! Now I have no more distractions blocking out Jehovah’s spirit. Jehovah gets to define what he himself is really about and what the real translation is regarding the bible, and the real mediator , Christ! I am in spritiual paradise! Thank you so much for that statement: “Through our words and actions, we have opportunity to represent God’s Word in ways that genuinely reflect God’s heart. That is one of the greatest privileges of the Christian life.” And for the prayer, of course. And doesn’t the whole affair remind you of this? Does anyone see my point here with the correlation to Napoleon’s coronation? Alden I appreciate your contributions here! I did not get the point re Napoleon’s coronation, and I did skim the lengthy article link you embedded… there is just so much info these days to read and comment on, it can be overwhelming. Pope Pius VII and put it on his own head. The analogy, I take it, is that the GB is not willing to wait for Jesus to give them the “crown of life” but arrogantly take it themselves. My question is, if the F&DS did not begin until 1919, then who are the authors of the New Testament? Didn’t they give out meat in due season under inspiration? I could add to Bob’s question- if the GB is the F&DS, how could there have been a GB in the 1st century, as it didn’t appear until 1919? with the points you just mentioned, I can see the new light flickering…and then now it’s off! i just want to share something today. last night i was flipping through my gadget and then the 2013 daily text caught my eyes, so i opened it and read few columns hoping i wouldn’t find anything that would discourage me, because i honestly still think i can still get some good bites from some of the publications, those that are neutral and beneficial. It’s interesting that on that day the acts 27:11 text with the dot dot dot….and it seems like the commentary below the text isn’t really what the text is all about…hmmm.. anyone noticed this? i’d like to hear some comments. whateverhappenedtome: I think you are referring to ‘ellipsis’ (omitting a word or words from sentences). The WT makes frequent use of this technique and not just with scriptural references. I noticed this in the Oct and Nov 2011 WT articles on the destruction of Jerusalem. They use ellipses to make scriptures or quotes (from scholars in the particular subject under discussion) appear to support WT argumentation, when in reality the very opposite is true. In the case of the above Nov article, I have seen on the internet an email from a researcher quoted in this article that the WT misrepresented his work. Conclusion: beware of WT use of ellipses. They use the dot, dot, dot for a reason. The daily text is really about ‘examining the Watchtower daily’…a part ot the continuous brainwashing by the WBTS. .. Being an ex bethelite ,I remember that if one was assigned to comment at the morning worship,as one prepared their comment,they were expected to first look up the WT magazine from which the text was taken from. .not the Bible, then research further in other WT publications,again,not the Bible. Father please be with your servant Najam help them to cope with these trials and the threats from those that persecute your people. Give Holy Spirit and strength to Najam as it is needed. many of us here also have the same fear as you do. fear from being spiritually cut off from families, but if we continue to pray for strength and courage…then we can really feel God’s holy spirit fueling us and helping us cope with the trials that may come along the way of our spiritual journey. May Jehovah and his son Jesus guide you and strengthen you. When I read the Koran [Darwood English version]. I got the impression Mohammed made a passing distinction between the religion [Islam] and the individual’s faith. Islam you may have left, in the terms of Religion but possibly not culturally as the Arab World is Islamic just as much as English is Shakespeare. If all the trees were pens and the oceans ink….. poetry! Belief in the One God of Abraham and belief in a last day. Just as Islam was warred against, so too the Heretic; JW faith would have got you burnt at the stake for denying the trinity. While an Arab could recite; William Tyndale was Burnt. And lastly; become a serious believer and follow the moral directions of scripture for Mohommed did say that such among Jews and Christians, would get thier reward did he not? You might consider Mohammed was [sort of] your John the Baptist? Cannot help any further the Koran was all I read. I always hated the daily text. My dad would not allow us to eat until we had recited the scriptures for the last several days correctly. He would stand me in from of him and scream at me for not remembering. Many mornings I didn’t get breakfast because I wasn’t able to get it right. Such harsh traditionalism… Thanks for sharing Sarah, that must have been hard.